We continue with representing of new features on our updated www.vedictime.com. This time, let's talk about Janma Kundali (birth chart) functionality. 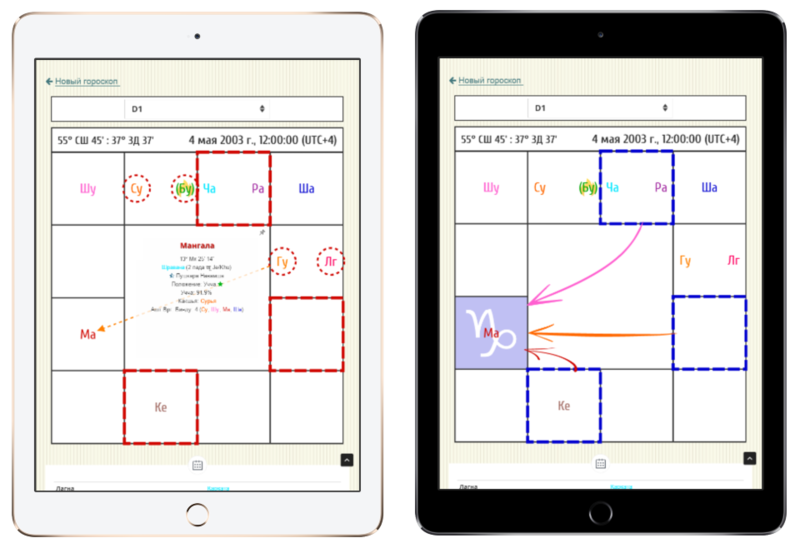 We believe that this is a cornerstone of our project, because without a convenient and powerful functionality for analyzing a birth chart, it would be meaningless to study Jyotish at all. Recently we received lots of questions concerning above-mentioned innovations (like "what are all these arrows about?") and decided to dedicate a small article to it. - Solid circle. It shows Graha Yuti (union of planets in one Rashi (zodiac sign)). The color of circle corresponds to the color of Graha from which Yuti comes. - Dotted circle. A Graha in a dotted circle tells you that it gets a Drishti (aspect from planet to) from the one that you have selected (clicked or moved a pointer to). Again, all dotted circles will be in color of selected Graha that makes the Drishti. - Dotted arrow. It shows that the “passive” Graha Drishti (aspect from planet to planet) is received by selected planet. In this case, the color of the arrow corresponds to the color of Graha, which "throws" a Drishti. In addition, by selecting a Graha you may notice that 3 Rashis (signs) will be highlighted in bold dashed line around their perimeters. The color of this line will match the color of this Graha. This effect shows that Rashi (and, respectively, all planets in it) is aspected by Graha with Rashi Drishti (sign-to-sign aspect). And the last but not the least – following the Rashi Drishti rule a Graha gets a passive Rashi Drishti from bold dashed lined Rashis, and, as a consequence, from Grahas in those Rashi. - Dotted bold line around 3 Rashis. As described above, this effect highlights those signs, which are aspected by the pointed Rashi. Dash color corresponds to the color of Graha, which is a lord of pointed Rashi. - Continuous curved arrows in different colors. These arrows are coming from Rashis that "throw" Rashi Drishti to pointed Rashi. Each arrow color corresponds to the color of Graha, which is a lord of Rashi that “throws” Rashi Drishti. NB! You can turn on and off the displaying of all above-mentioned elements in Janma Kundali settings. To do this, simply click on a gear sign in web-site's left menu.